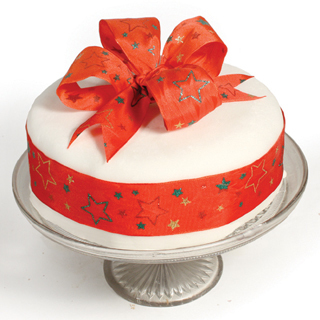 If you’re one for making lists, your Christmas Cake should be near the top this week. A rich, moist Christmas cake needs a little time, but don’t be put off. Your efforts will be well rewarded. Our favourite gluten free Christmas cake recipe – inspired by our Baker’s Gift Box – is filled with wonderful berry, citrus and mixed spice flavours. Between now and Christmas, these will fuse together to create an unmistakeable deep, rich Christmas treat. No one will guess it is gluten free. Free with brandy or sherry to keep moist, if you like, but this step is not essential. Beat in the eggs, mixed spice, brandy, lemon rind and juice. Stir in the mixed dried fruits, glace cherries, mixed peel and almonds. Push the mixture into a deep greaseproof lined 20cm/8″cake tin. Bake in a pre-heated oven for 2/2¼ hours. Allow to cool in the tin for 12 hours. To make the topping, warm the apricot jam and spread it over the cold cake. Roll out the marzipan and lift it onto the cake. Press the marzipan around the cake and trim off any excess. In a bowl beat the egg whites until stiff. Beat in the oil and icing sugar a little at a time.